New Year’s Eve isn’t really a big thing for us. We don’t do it big. So, having something a little more structured and fun, is right up our alley. As is all of the events that make the New Year ring in at noon instead of midnight! 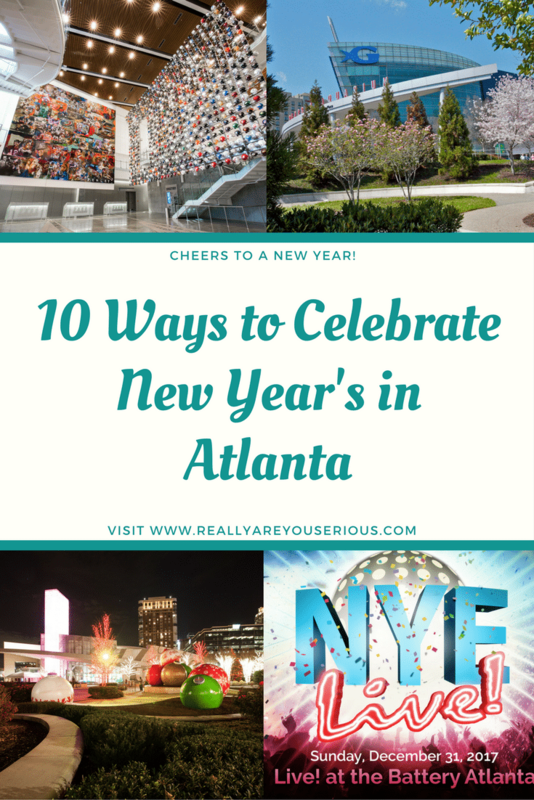 As thousands of local residents, tourists and college football fans prepare to ring in 2018 in Atlanta, World of Coca-Cola put together a list of 10 things to do in the city (both football-related and not) this New Year’s Atlanta weekend. 1. It’s not too late to savor the season at World of Coca-Cola! New Year’s weekend (through Jan. 2) is your last chance to experience the attraction’s holiday celebration. Guests will enjoy festive décor, samples of the limited-time beverages Coca-Cola North Pole Magic and Coca-Cola Zero Sugar Arctic Chill, plus two seasonal exhibits that bring Coca-Cola’s connection to the holidays to life. Check out images of the attraction all decked out for the holidays here. 2. Music lovers can spend their final moments of 2017 at a number of concerts around the city – catch Band of Horses at the Coca-Cola Roxy or Widespread Panic at the Fox Theatre. 3. Auburn and UCF will face off in the 50th annual Chick-fil-A Peach Bowl at 12:30 p.m. on New Year’s Day at Mercedes-Benz Stadium. Before the game begins, football fans can cheer on their teams during the Chick-fil-A Peach Bowl Parade. Considered the official kickoff for game day, the parade will bring floats, classic cars, team mascots, marching bands and cheerleaders to the streets of downtown Atlanta before concluding at FanFest in the Georgia World Congress Center. 4. The day before the big game, Tigers and Knights fans can dive into an evening of underwater fun at the Chick-fil-A Peach Bowl Fan Night at the Georgia Aquarium. From 4-8 p.m. on Dec. 31, guests can see tens of thousands of aquatic and marine life, while rubbing shoulders with each team’s cheerleaders and mascots. Later that evening from 8:30 p.m.-12:30 a.m., guests can swap their football jerseys for cocktail attire for the Sips Under the Sea New Year’s Celebration, featuring food, drinks and live entertainment. 5. With Kid-friendly New Year’s Eve parties across Atlanta, you can celebrate the new year with your little ones AND get them tucked in bed on time. From Noon Year’s Eve at Fernbank Museum of Natural History and Noon Year’s Eve at Ponce City Market’s Skyline Park to Children’s Museum of Atlanta’s New Year’s Bubble Bash and the Kids’ Early New Year’s Eve Celebration at Stone Mountain, there’s something for children of all ages and interests to enjoy. 6. Celebrate 2018 in high style at the Masked New Year’s Eve Ball at Ponce City Market’s Skyline Park from 8 p.m.-1 a.m. Perched atop the roof of Ponce City Market, this black-tie-optional event will feature incredible skyline views, food and beverage specials, live music and more. 7. For the complete football fan experience, check out the College Football Hall of Fame and Chick-fil-A Fan Experience. In celebration of the Chick-fil-A Peach Bowl, from Dec. 27 through Jan. 2, the attraction will host Fan Days, allowing guests to immerse themselves in the rich traditions and history of college football for a discounted rate of $17.99 for adults and $14.99 for children. 8. Looking for one more way to get your football fix? “Rise Up” into 2018 by cheering on the Atlanta Falcons as they take on the Carolina Panthers at 1 p.m. on Dec. 31 at Mercedes-Benz Stadium. 9. The party at SunTrust Park doesn’t stop when baseball season ends. Ring in 2018 at NYE Live!, taking place at Live! at the Battery from 8 p.m.-1 a.m. The party will feature all-inclusive food and drinks, live music, DJ performances and a viewing of the Times Square Ball Drop on Live! at the Battery’s 30-foot LED screen. 10. Start 2018 on the right foot at the Atlanta Track Club Resolution Run! Runners will get the new year off to a healthy start by participating in a 5K, one-miler or 50M dash. Races will begin at 10 a.m. on Jan. 1 in Piedmont Park. I’m all about taking family to a local sight and then getting my Netflix countdown on at noon! A masked ball at Ponce City Market sounds like tons of fun. That would be a new and different way to ring in the new year!